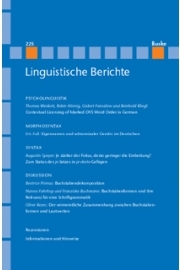 In this paper a new analysis of German correlative clauses such as Je weniger Gepäck wir haben, umso leichter werden wir wandern (the less luggage we have, the easier we will be able to hike) is put forward, based on work by den Dikken. Correlative clauses are seen as base generated as part of their correlate phrase in the matrix clause. 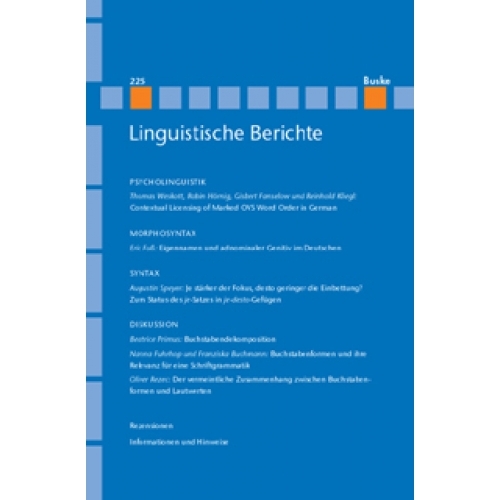 The above example is thus base generated as ...wir [umso leichter,[je weniger Gepäck wir haben]], wandern werden (which is a licit constituent order in German). This status as a partial constituent explains certain similarities with relative clauses (being partial constituents as well) such as the impossibility of movement to a position such as the prefield or the middle field. Correlative clauses are often leftward dislocated, the area left of the clause proper being virtually the only place they can be moved to. The reason why left dislocation of correlative clauses is so frequent is that this is the only possibility to avoid a stress clash which is inevitable in the base position of correlative clauses because both, the introductory element of the correlative clause (je weniger Gepäck) and the matrix correlate (umso leichter) bear focus. This explains also, why both clauses, matrix and correlative clause, have independent focus-background-structures; as this fact is conditioned by the shape of the sentences themselves it cannot serve as argument against embeddedness of correlative clauses.